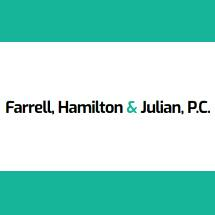 Farrell, Hunter, Hamilton & Julian, P.C. is a general practice law firm that represents business and individual clients in a broad spectrum of legal areas. In 1965, John A. Farrell established the law practice in Alton, Illinois. The present firm is a continuation and expansion of that practice over the last several years. Our attorneys are licensed to practice in the state and federal courts of both Illinois and Missouri. We are large enough to handle complex matters, yet small enough to deliver service that is personal and concerned. We are committed to providing quality legal services in a responsive, timely and efficient manner. Clients appreciate our policy of open and frequent communication concerning the status of their legal matter. At Farrell, Hunter, Hamilton & Julian, P.C., clients have the opportunity to draw upon the experiences and expertise of every attorney in the firm. The skills that our attorneys individually possess are available to serve the needs of every client. Day-to-day changes in the law through case decisions and statutory changes require a continuous effort on the part of the firm to keep current. Out attorneys and paralegal staff regularly participate in continuing legal education programs, seminars and bar association activities to ensure that the client's representation is based on current legal knowledge. In order to ensure the efficient delivery of legal services to our clients, we maintain a knowledgeable and experienced support staff and utilize state of the art equipment. This minimizes delays in servicing our clients' legal needs. We are proud of our secretarial staff, and seven of a total of eight have been employed more than five years with service ranging to seventeen years. Dwight Werts, Werts Welding & Tank Service, Inc.